Have fun building numbers with the game musical chairs! Split the class in two. Set up chairs (labeled with place values) on both sides of the room for each team. 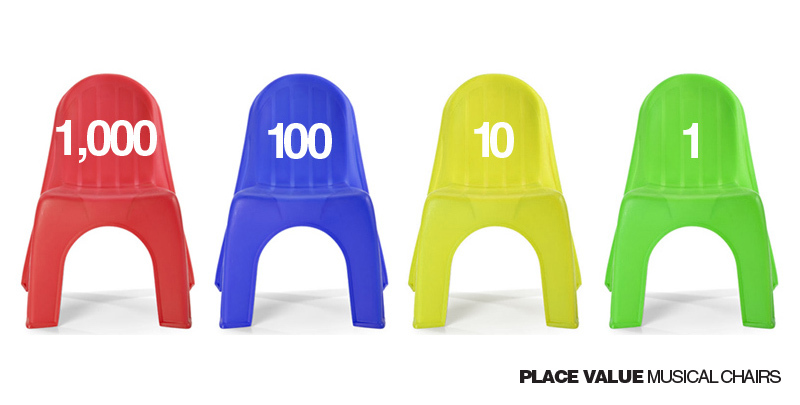 The number of chairs you need depends on what place values you are teaching. Next, throw single digit numbers (0-9, written on scrap paper) in a paper lunch bag. You will have to repeat numbers so all kids will have one. Each kid pulls a number out of the bag and tapes it on his shirt. Start up the music and play musical chairs! Both teams dance around their chairs. When the music stops, kids quick sit in a chair. Write the numbers both teams made on the board and compare. Which team created the largest number? The winning team gets a point. Next, challenge the team that lost to rearrange their number to create a larger number. Is their new number larger than the winning team's? If so, they get a point! Then, instruct both teams to rearrange their numbers to create an even or odd number. Which team was the fastest in building a number? The fastest team gets a point! Start the music up again and play for as long as you'd like!